India's first ever contest to appreciate, recognize and reward the contemporary Indian women for their homemaking skills. This is not a competition, but a celebration- a beautiful celebration of womanhood , where all the lovely women come together to empower each other. Women have made their illustrious presence felt in every field. From rocking the cradle , to leading companies and countries, women have carved a niche for themselves .Women in their lifetime take up various roles – a loving daughter, an indulgent and caring mother , a supportive wife and still maintain their individuality - dreaming, working , inspiring and winning their way in this world . Mrs. Homemaker celebrates this very essence of womanhood, saluting her myriad roles and lauding her countless colours. 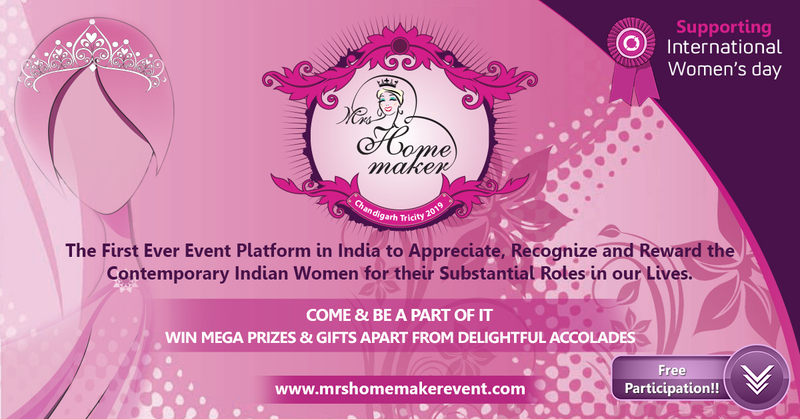 Mrs. Homemaker contest in itself is an entity celebrating true womanhood. It is unlike any other contest as the idea itself is unique and so is going to be its execution. It is the biggest ever; one of its kind attempts to give women the platform where they get lauded and appreciated for being what they are. It has been highly recognized in North India and America. Mrs. Homemaker is not your run of the mill beauty pageant, it is an ingenious celebration of womanhood which welcomes every women.